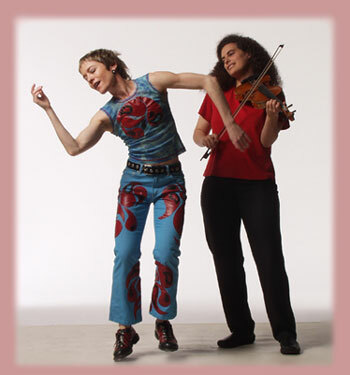 Enriched and inspired by the multitude of rhythms and traditions they have encountered on their artistic paths, Sandy Silva and Laura Risk present a travel notebook of their forays into this eclectic world. These two women bring the audience on a journey of discovery into the heart of this bountiful, sensual and colorful heritage with a dramatic interplay of traditional music and dance, innovative choreography, and raw improvisation. This powerfully intimate performance was born from Sandy and Laura's fruitful collaboration with Julie Lachance, choreographer of Cirque de Soleil's Dralion and chief choreographer of the National Circus School of Canada. The combination of their talents creates a mixture flavored with energy, passion, tenderness, and humour.